Gelatin (capsule), rice flour, magnesium stearate (vegetable source), silicon dioxide and stearic acid (vegetable source). As a dietary supplement, take 2 capsules with food daily, or as directed by a healthcare professional. Store in a cool, dry place. A highly concentrated polyphenolic complex providing all three of the active curcuminoids found in turmeric. Turmeric (Curcuma longa) is a perennial plant found in the ginger family. The dried and ground rootstock of this plant is the source of the orange-yellow turmeric spice commonly found in Indian and Middle Eastern cuisine, most notably curry. The active component of turmeric responsible for its rich color and potential health benefits is known as curcumin. 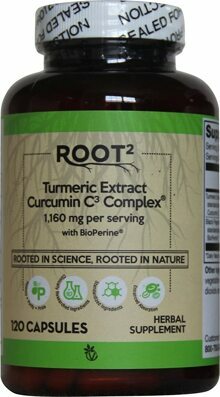 What are the key benefits of ROOT2 Turmeric Extract Curcumin C3 Complex with BioPerine? ROOT2 Turmeric Extract Curcumin C3 Complex with BioPerine is Rooted in Science, Rooted in Nature. All supplements are formulated to deliver the level of support you expect and deserve. Whether you’re shopping vitamins, minerals, herbs or other key nutrients, their potency is guaranteed – what’s on the label is what’s in the bottle. Plus, all supplements adhere to the FDA’s Current Good Manufacturing Practices (CGMPs), ensuring that they are manufactured to high standards of POTENCY, PURITY, efficacy and safety. We take PRIDE in what we do, which is why we promise if you don’t love your product, we’ll take it back – even if the bottle is empty. Rooted in Science, Rooted in Nature. ROOT2 delivers nutritional supplements featuring ingredients that connect you closer to the Earth and health benefits backed by scientific research. These whole-food based products strive to exceed lifestyle and dietary demands. All you have to do is choose from the wide selection of organic, vegan and vegetarian options, and ROOT2 will deliver the assurance and affordability you need. As a dietary supplement, take 2 capsules with food or as directed by a healthcare professional.